Find out more about the former guild rackets a new merchant lord has his eyes on. Eavesdrop on people in Abah's Landing to investigate the blackmailing. Zeira has concerns about an ambitious merchant lord named Cosh. She wants to learn if his interests overlap with those of the Thieves Guild. Percius Loche, an esteemed tailor, will help you get into No Shira Citadel undetected. 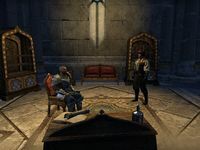 Talk to Zeira in the Thieves Den. Meet Walks-Softly at the harbor in Abah's Landing. Investigate the captain of the Dreamsnake. Investigate the Imperial client of a local dockyard boss. Find Velsa at Spotless Goods Shipping Concern. Obtain a disguise from Percius Loche or steal it from Sailor's Rest. 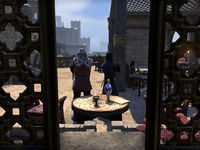 Head to the merchant camp outside No Shira Citadel. Gain access to the Iron Wheel Headquarters. Find out how Cosh is connected to the Iron Wheel. Escape the Iron Wheel Headquarters and return to the Thieves Den. What is the fate of the lawbreaker: A ring of iron around them. What is the fate of the unrepentant: We burn our truth upon their canvas. What of those who would deny their fate: The Wheel turns ever onward. When you are tasked with escaping from the Iron Wheel, you can teleport to the Abah's Landing wayshrine instead. I should speak with Zeira and see what she plans to do. Zeira sent the others ahead to see what they could learn. Walks-Softly is waiting for me nearby—I should speak with him first. I can find him at the Abah's Landing harbor. Walks-Softly thinks the captain of the Dreamsnake may be a candidate for Cosh's blackmail. To confirm this, I should spy on her meeting in Abah's Landing or try to steal Captain Evani's log. I should speak with Quen and see what she turned up. I can find her at the Abah's Landing harbor. Quen suspects a dockyard boss may be a candidate for Cosh's blackmail. To confirm this, I could spy on a meeting he called with "the Imperial client," or search the Imperial's private room at the Serpent and Senche. Velsa went to Silver-Claw's shop. I should speak with her there. Silver-Claw seems distressed. I should speak with him and see what's wrong. Silver-Claw says Velsa headed to No-Shira Citadel, the Iron Wheel's headquarters! Before I follow her, he insisted I procure a disguise for my own protection. I should speak with Percius Loche at the Diamond Thimble. Percius Loche crafted an outfit for a servant who works in No Shira Citadel, but was never paid for the trouble. He suggested I recover it for my own use. Alternatively, he will sell me a similar outfit. I should speak with Velsa about why she's at No Shira Citadel, far south of Abah's Landing. Velsa learned Cosh is currently inside the Iron Wheel's headquarters. She wants me to find out his connection to the Iron Wheel and steal his blackmail. For her plan to work, I need to learn the pass-phrase needed to gain access. Velsa wants me to learn more about Cosh's plans. If I have the chance, I should steal whatever blackmail material he has at hand. Objective Hint: Steal Cosh's "Evidence"
Cosh is meeting with Chief Inspector Rhanbiq! I should spy on them and learn Cosh's connection to the Iron Wheel. Cosh made a deal with Chief Inspector Rhanbiq to recover a missing dowry. I should escape from Iron Wheel Headquarters. Finishes quest I should bring what I've found to Zeira. Perhaps she can make sense of it. This page was last modified on 15 November 2018, at 23:15.